A political crisis had been brewing in Bangladesh for quite some time as the anniversary of the 5 January 2014 Bangladesh election loomed. It came to a head when on 3 January, 2015 police prevented Khaleda Zia, the leader of the opposition Bangladesh Nationalist Party, from leaving her Gulshan office and the police then subsequently refused to give permission to allow the party to organize a rally it has planned on 5 January 2015. Khaleda Zia then announced a non-stop 'blockade' of the country, and this resulted in the arrest of a number of senior BNP leaders including almost immediately Mirza Fakhrul Islam Alamgir, the party's acting secretary general on the 6 January. Political violence is rarely absent in Bangladesh - but these events have triggered a particular spate of violence around the country. 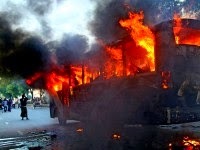 Perhaps there was a time in Bangladesh when calls for blockades or hartals would have popular support, and people would voluntarily stop commuting - but now in order for this kind of political action to have any chance of widespread success, the party calling the blockade/hartal must find a way to scare the public from using public transport, and that requires forceful intervention, including the setting fire to vehicles. Below is a list of 119 people reported in newspapers (as of 24 February) to have died since 5 January in the political violence. For every death, of course there are many injured, some of them very seriously. This list should not be taken as gospel - an incident may be reported as linked to political violence, when there may in fact be other reasons for it, and in a number of these cases set out below, there are conflicting accounts of what happened. In addition, the list leaves out eleven deaths at the hands of the police which do not appear to be linked to the political conflict, involving alleged robbers etc, though they may well be connected. You will find different newspapers have slightly different numbers (for example, New Age does not count two deaths - nos 8 and 27, in their count). However, the list has attempted to be comprehensive. The list assigns responsibility either through what witnesses/police are reported in the newspapers to have said to reporters, or though the assumption that an arson attack on a vehicle will have been done by opposition picketers, and a killing of opposition activists will have been done by law enforcement authorities or by government party alliance activists. In some individuals cases, it may be found later that these are not correct assumptions and it is possible (since some government party individuals have been arrested making bombs) that not all the vehicle bombings have been done by opposition activists or those they control. It should be noted that killings by police can be lawful if proportionate force was used in the particular circumstances at that time, and the Bangladesh law enforcement authorities always do claim that any deaths of individuals in their custody or as a result of their shooting were lawfully done. - 61 of them are members of the public who have died as a consequence of direct action by apparent opposition activists, most of them burnt to death. (nos: 5, 10, 13, 14, 15, 16, 17, 18, 19, 20, 21, 24, 25, 26, 29, 33, 34, 35, 36, 38, 41, 42, 43, 46, 47, 49, 51, 52, 53, 54, 55, 56, 57, 58, 59, 62, 63, 64, 65, 69, 70, 72, 73, 74, 75, 76, 81, 82, 83, 85, 86, 87, 88, 89, 91, 93, 97, 101, 108, 109, 112). To read more about the issue of assigning criminal responsibility for these deaths, click here. The category 'Political identity/occupation' of the person distinguishes those was are involved in politics and those who are general members of the public.